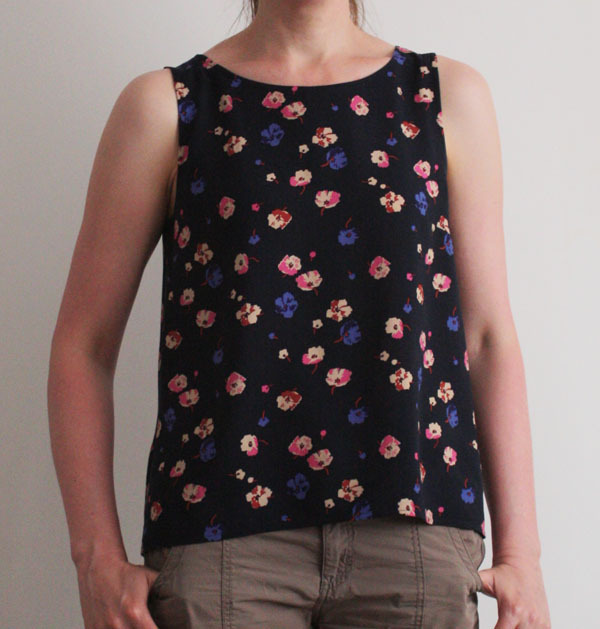 My sewing plans at the moment have a focus on summery tops as with the good weather we’ve been having of late, I’ve realised I don’t have many tops that I like to wear when it is warm and sunny. 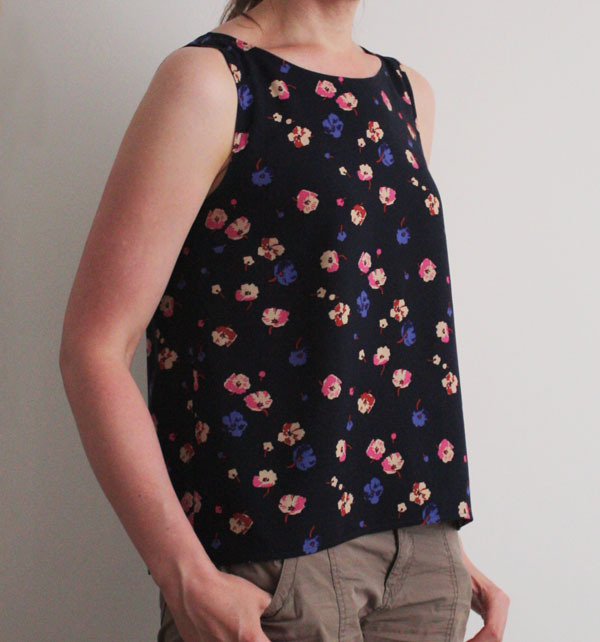 Recently I was kindly offered a Simplicity pattern of my choice in exchange for a review and after drooling over a few dresses that in reality were beyond my current capabilities (and that I’d be unlikely to wear much), I homed in on Simplicity 1693 as it fits right in with my more summer tops plan and includes an impressive number of variations. For my first version I made view C but without the waist elastic. I was so pleased with the finished top that I wore it out just a few hours after finishing it! You may recognise the fabric from my first Belcarra. It felt a little weird making another top from the same fabric so soon, but I knew that it would drape the way I wanted so went ahead. The only issue I had with the pattern was the sizing. Going by the size chart, I should have been a 14 grading to 16, but luckily I made a quick toile and found that the top swamped me. I then compared the pattern pieces to those of the Belcarra and Sorbetto tops I’ve made and decided that a 12 grading to 14 should fit better. I also lengthened the pattern by 3 cm at the hem since I’m tall. 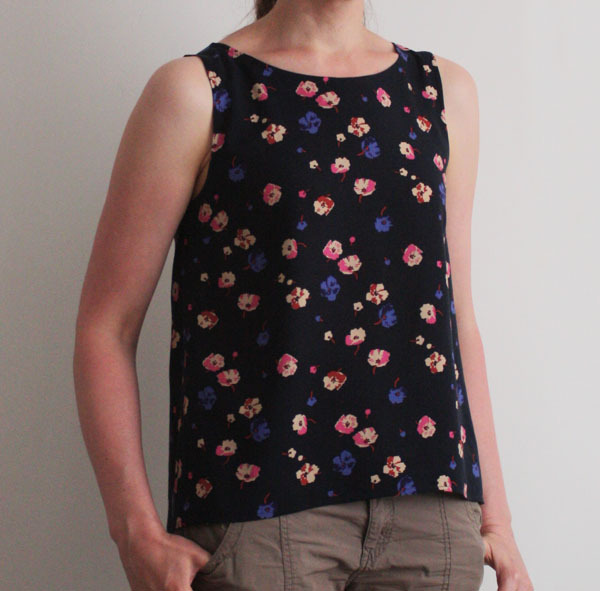 The top is pretty straight forward to sew together and I used French seams throughout (the pattern instructions include details on how to do them). My darts ended up rather wonky, which I think was due to a combination of my trying a new method of making the pattern marks (dressmakers carbon and tracing wheel instead of pins and marking pencils) and the fabric being more mobile than the cottons I’d generally used so far. Luckily the dark fabric and print do a good job of hiding the wonky-ness! The neckline and armholes are finished with bias binding facings, so I made bias strips with the same fabric. For the armholes I tried out the technique described by Lauren of lladybird as part of her outfit along, except I folded the bias tape in half before applying (a la the Belcarra instructions) instead of folding and pressing twice once sewn on. Even though I’m not taking part in the outfit along, I’ve really been enjoying Lauren’s detailed posts and feel like I’ve learnt loads – the time and thought she has put in is quite something. I like the button closure detail at the back of this top (the neck is large enough for me that the button opening isn’t necessary, but I like how it looks) and this provided my first go at making a thread loop. I found a few different ways of doing this online, but ended up just following the diagram in the pattern, think it has worked out ok for a first attempt, you can’t really see it anyway. The button closure means there is a centre back seam to this top. I did think about pattern matching this seam, but didn’t have much fabric left so decided instead to place the pieces such that there wouldn’t be a bright or big flower along the seam so that it is somewhat disguised, I think this worked out ok. Trying the top on pre-hemming it looked a bit longer at the front than the back (I think this must be due to my shape or posture because I noticed the same with the Belcarra). This was really noticeable if I wore a belt (to try to test out how it would look with the waist elastic), so I decided to trim a bit off the front. I got a bit carried away and took about 4.5 cm off the centre front, tapering to the original length at the side seams. I didn’t think the top looked very good with the belt any more so left out the elasticated waist, but I quite like the gentle high/low hem that this has created (like a subtler version of view F). Yep, definitely familiar! 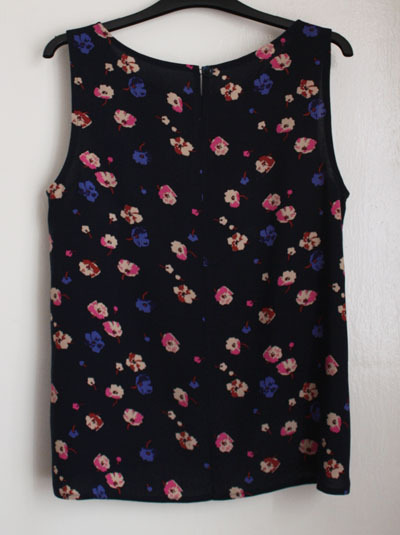 Convinced myself it was ok to have both a sleeved and a sleeveless top in the same fabric. This looks lovely on you. Well done creating the button loop too. I wouldn’t worry about making a different top in the same fabric its a beautiful print – I’m about to make another green skirt (the same fabric as my Tulip skirt). Let’s call it stash-busting! Hi Alex, I have nominated you for the Versatile Blogger Award (although I wasn’t really sure if you may already have a nomination). I have really enjoyed reading about your sewing adventures since our meeting at the V&A in May.